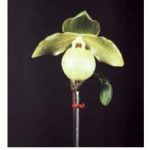 The discovery of several new paphiopedilum species since 1980 has provided rich pickings for hybridisers. 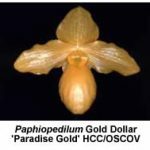 In particular, the use of four new Chinese species, namely Paphiopedilum armeniacum (1982), P. micranthum (1982), P. malipoense (1984) and P. emersonii (1986), has led to the introduction of a number of cool-growing and relatively easily cultivated hybrids with flowers of new colour and form. Together with the re-discovered P. delenatii (found in Vietnam in the early 1990s), they provide a range of yellow, pink, green and white colour options as well as interesting shapes, greater flower size and unusual textures. One of the earliest crossings with members of this new group used P.armeniacum, which has bright yellow flowers, and P. delenatii, which has soft pink flowers. The hybridiser’s expectations were for vibrant apricot flowers but the outcome was a large, well-shaped white flower, aptly named P. Armeni White (registered in 1987) ¹ . While the colour was perhaps a disappointment to the hybridiser, this is an excellent cross with a lovely large white to cream flower shaped like that of P. delenatii. This hybrid is a worthwhile addition to any collection; the crossing is still available, having been re-made with parents of better quality. Notwithstanding this apparent setback, P.armeniacum has been used extensively as a parent in other hybrids with excellent results. 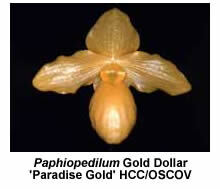 Both P. Fumi’s Gold (x P. concolor) and P. Gold Dollar (x P. primulinum) have excellent gold-coloured flowers. P. Dollgoldi (x P. rothschildianum) and P. Canary Welz (x P. chamberlainianum) are interesting multi-floral P.armeniacum crosses. Although P. micranthum is now frequently seen on the show bench, I still marvel at the sight of its large, pink, puffball flower. Its crossing with P.delenatii gave promise of even larger and pinker flowers. The resultant P. Magic Lantern (1990) is an excellent outcome, the flowers being larger versions of P. micranthum with more intense colours. Crossings now in train using selected plants of the re-discovered P. delenatii should be even more spectacular! A recent crossing of P. micranthum with P. Armeni White produced P. Hsinying Pinkball, a name that vividly describes its labellum. P. Charlie O’Neill (x P. godefroyae), P. Gloria Naugle (x P. rothschildianum), P. Fumi’s Delight (x P. armeniacum) and P. Kevin Porter (x P. bellatulum) are other successful P. micranthum hybrids. P . malipoense carries an apple green flower on a long raceme. Although being variable in size and shape, depending on its regional habitat in southern China, its offspring convey much of the colour, petal markings and texture of the parent. 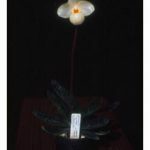 P. Lynleigh Koopowitz (x P.delenatii), P. Ma Belle (x P. bellatulum), P. Envy Green (x P. primulinum) and P. Norito Hasegawa (x P.armeniacum) are all desirable hybrids that are well worthwhile acquiring. P. Harold Koopowitz (x P. rothschildianum) is another excellent crossing now becoming more readily available. 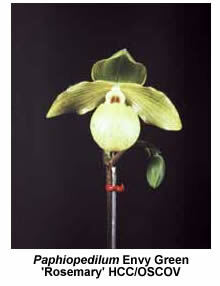 The last of the quartet of Chinese paphiopedilum species to be discovered and introduced (in 1986) was P. emersonii. It has plain green leaves and a white to cream flower highlighted by a yellow, textured lip. Like P. malipoense, P. emersonii is rather variable in shape and size, some forms having round, well-shaped flowers, while others possess oblong-shaped flowers with floppy petals. 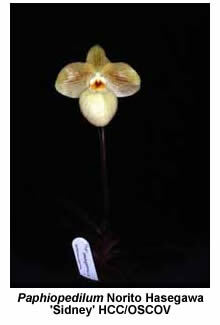 However, white paphiopedilums are keenly sought and P. emersonii was soon utilised as a parent. 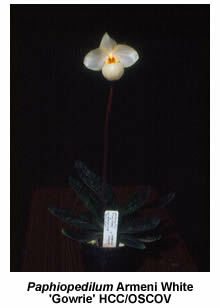 P. Joyce Hasegawa (x P. delenatii) was registered as early as 1991, as was P. Mem. Larry Heuer (x P. malipoense). P. Cam’s Cloud (x P. bellatulum), P. Franz Glanz (x P. armeniacum) and P. Gerg Rolke (x P. rothschildianum) are other newer crossings. 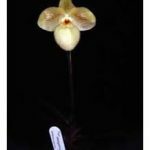 More recently, two new paphiopedilum species with some affinity to the above Chinese quartet have been introduced from northern Vietnam, namely P. hangianum and P. vietnamense. The former has a large cream flower with floppy petals, a little like some forms of P. emersonii, while P. vietnamense has large pink flowers. Both species are now being used for hybridising and some of these new crossings have already been registered. While I haven’t seen any photographs of these new hybrids, P. Ho Chi Minh (P. vietnamense x P. delenatii), is described as having large pink flowers. P. Wossner Vietnam Beauty (P. bellatulum x P. vietnamense) and P. Wossner Butterfly (P. malipoense x P. vietnamense) are other interesting registrations. Also in the pipeline are crossings using P. hangianum and all four of the Chinese quartet, as well as P. vietnamense and P. delenatii. 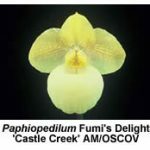 Small plants of these two new species and their hybrids are now available from selected Australian orchid nurseries. 1. A. Hope. 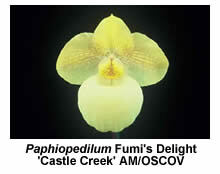 The Mystery Paphiopedilum in More Orchids in Victoria (2002), p. 20.